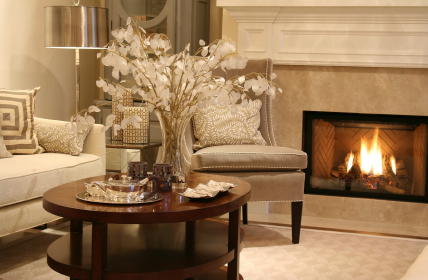 What Are Vented Gas Fireplaces? Vented Fireplaces utilize either an existing chimney or a small vent (much like a dryer) to use outside air in the combustion and exhaust process. They are extremely safe, energy efficient, and offer the same appeal as traditional wood-burning systems. Vented Gas fireplaces use outside air for combustion, expelling 100% of the combustion exhaust and by-products. They do this by featuring a sealed chamber that draws in fresh air from the outside and discards all gaseous by-products back outside. This double-wall venting system makes sure that your indoor air quality is unaffected, while you still get the warmth and ambiance of your fireplace. Many direct vent fireplaces use gas logs that provide the warmth and glow of a real wood burning fire without any of the inconvenience. Many gas logs are made out of a ceramic fiber material that has an extremely high insulation factor. This allows them to tolerate, trap, and radiate significantly more heat into a room than a metal fireplace or insert and is quieter because no fan is needed. Many direct vent fireplaces also feature a control system that provides energy conservation even as you are enjoying the warmth of a fire. These control systems feature intermittent-pilot ignition (IPI), allowing you to conserve fuel and money when the fireplace is not in use. This means that the pilot is not constantly a drain on your resources. In addition, the system offers seamless transition from AC to battery backup in a power outage, as well as built-in safety features and memory settings. Finally, most of these control systems feature the ease of wireless remotes.